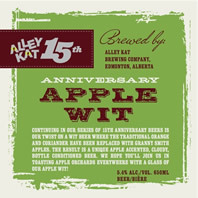 EDMONTON, AB – Alley Kat Brewing has released Apple Wit as the fourth in their series of limited edition 15th Anniversary beers. Wit beers are traditionally brewed by adding orange peel and other spices to the boil and fermenting with a special yeast. Our version omits the spices and orange peel, adding ridiculous amounts of Granny Smith apples to the fermenter and conditioning tanks instead. We fermented it using a traditional wit yeast. The result is a crisp, refreshing, bottle conditioned wit with overtones of cider. Alley Kat Apple Wit is available now at select beer and liquor stores throughout Alberta.